I have added a few new links to my Clarinet Resources. Each have some great information, but the Ultrasound Research conducting by Joshua Garder is particularly interesting. I was in attendance at his session for Clarinetfest 2011 at the University of California, Northridge. He used ultrasound equipment on Robert Spring to show what is happening inside of the mouth during register change and double tonguing. Stay tuned for more links added to the link list over time. 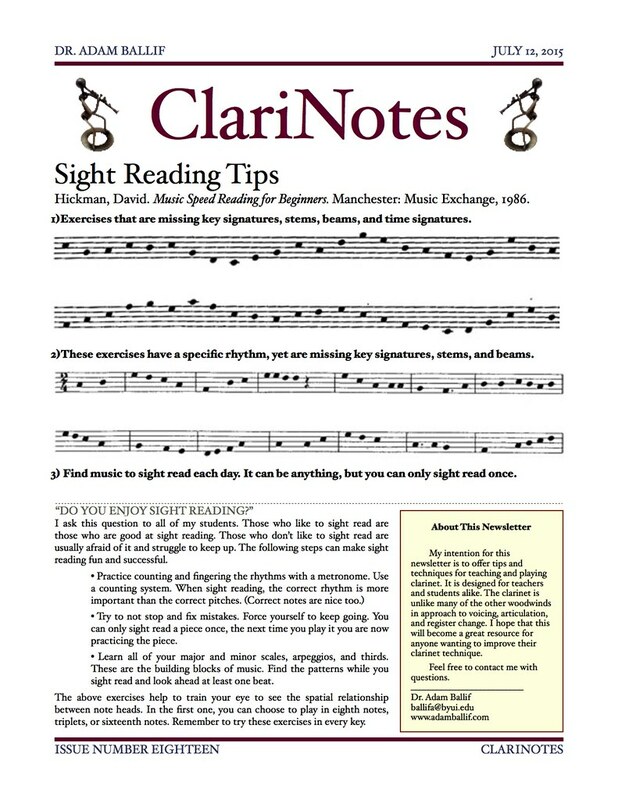 Send me anything that you find useful for clarinetists. The single most important piece of equipment you should upgrade, which will give you the most noticeable improvement in tone, intonation, and resonance is not your clarinet, but instead the mouthpiece. The mouthpiece, reed, ligature, and barrel, have the greatest effect on how you sound and how you feel as a player. The mouthpiece and ligature that come with a clarinet when you buy a new instrument, even professional-quality instruments, are merely basic and beginner in quality. There are hundreds of types of mouthpieces and ligatures on the market. Clarinetists are always interested in what is new and innovative in the world of mouthpieces. The above models are what have worked for me and would be a good place to start. 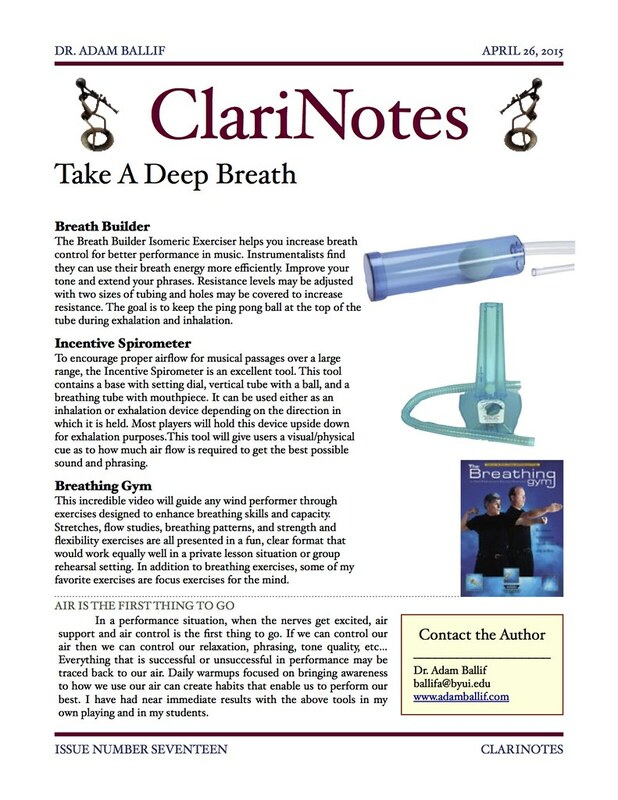 Make it a habit in your clarinet life to try new equipment as you strive for your perfect sound.I have added another issue to my [ClariNotes Newsletter](http://www.adamballif.com/clarinetresource/clarinotes/) outlining some equipment choices to consider. 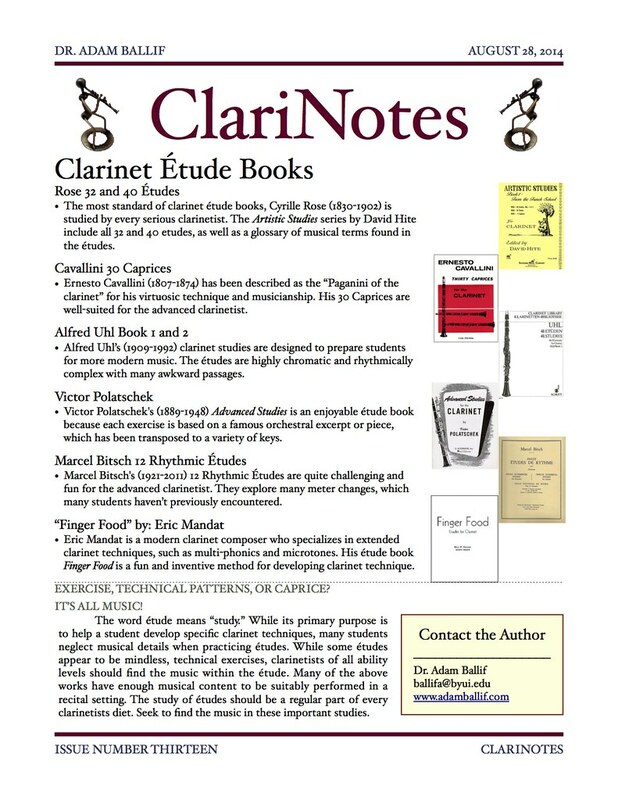 I have been wanting to add more clarinet resources to the site. I want this website to become a useful resource for clarinetists. 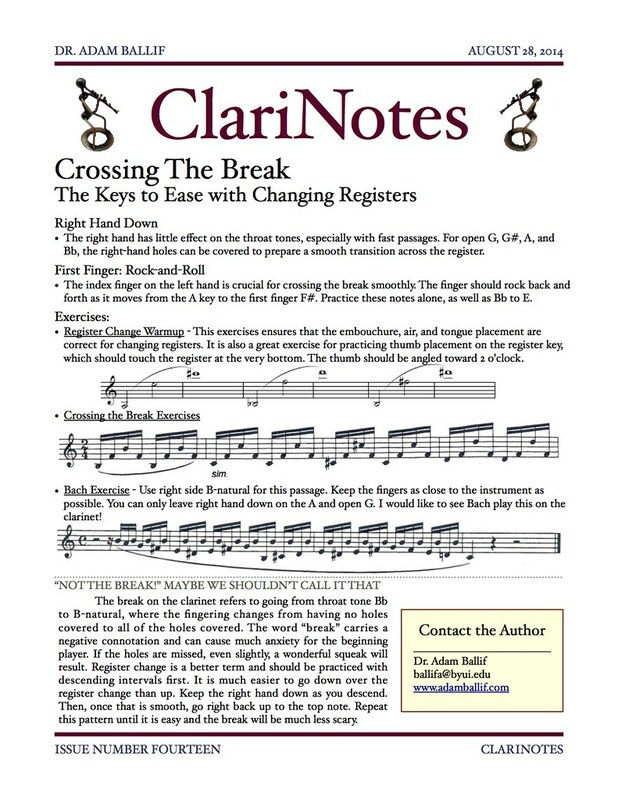 Today, I have added several links to the Clarinet Resource page. 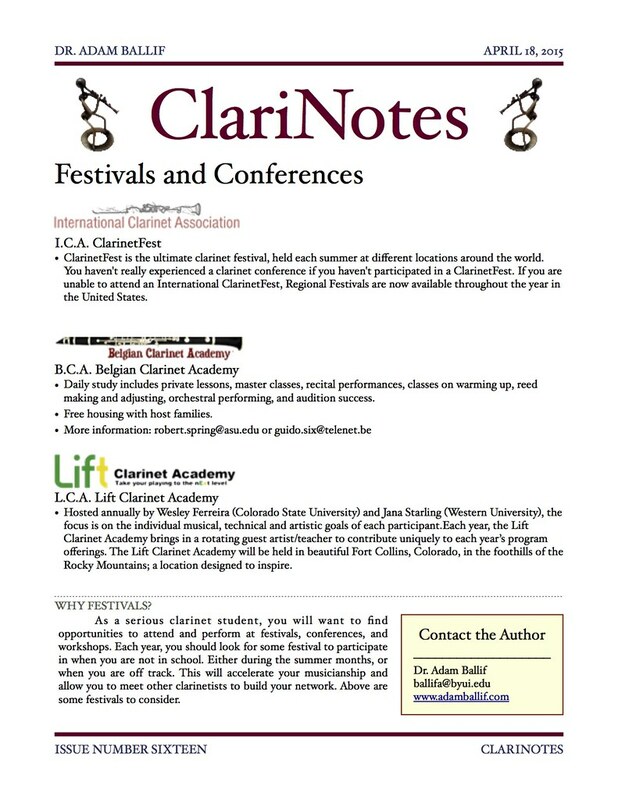 These are articles written by famous clarinet pedagogues from the past and present. I have also added a few more stores for purchasing new instruments and accessories. Sometimes I think that we forget that the clarinet is a wind instrument. We can get so focused on fixing embouchure, articulation, and finger placement, we may neglect the root of the problem that may exist in how we are breathing. Despite what some may think, the clarinet takes a lot of fast, cold air to respond and have a focused tone quality. "What happened at music camp? Your sound has changed. It is bigger and fuller. What happened at camp! My tone suddenly was bigger, more focused, and much louder. Since my tone was improved, my intonation also improved. The clarinet began to respond for me. High notes came out easier. Ascending skips were smoother and more connected. The Breath Builder is a tube with a ping pong ball inside. 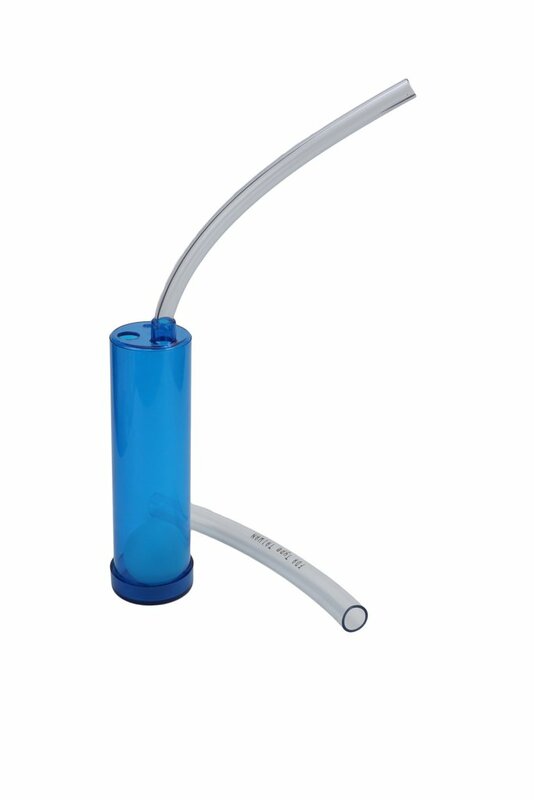 Two straws are provided: a large bore straw and a narrow bore. The objective is to exhale and inhale through the straw in such a way that enough air pressure is exerted to keep the ping pong ball raised to the top of the tube, both on exhale and inhale. Holes in the top of the tube may be covered to increase the resistance. I have used the Breath Builder with my students and the results are often magical. In just a few minutes, the tone and dynamic range are improved instantly. It takes repetition and daily practice to increase air capacity, but the instant feedback, from the ping pong ball, helps students feel what kind of air to use on the clarinet. If your students aren’t sounding the way you want, go to the probable root of the problem. Teach them how to take a “Breath Builder” breath.